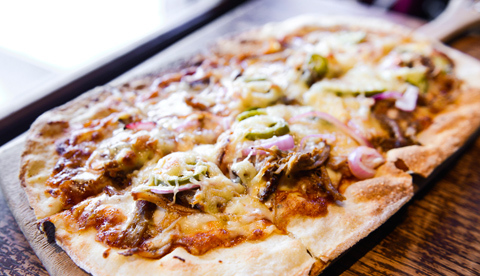 Whether we want to call it American wood-fired pizza or brewpub pizza, we all have a sense of what this pie looks like. So how come we haven’t properly defined it? Pizza and beer. The quintessentially American combo works happily in any iteration—from Bud and a Dominos delivery, to a more refined Neapolitan pie and a continental lager. Yes, that will suffice. Even Bushwick’s venerable Roberta’s, better known for its quirky wine list, knows that a smart beer selection—including tap offerings from Ommegang, Pretty Things, and Sixpoint—is fundamental to the pizza experience. Naturally, brewpubs recognized the simplicity of the match, and when adding “gastro” elements filled menus with a new(ish) articulation of wood-fire oven (WFO) pizzas. These are an amalgam of several styles, reworked for a beer-focused crowd, and largely unlike pies served in other locales—an Americanized version of the WFO. Few people fly the flag for brewpub pizza, yet its current ubiquity can’t be denied. The subset largely falls out of the purview of most standard pizza taxonomy. It isn’t bar pizza, which is thin-crusted and prepared in a gas oven. And it’s not strictly Neapolitan, which uses wheat flour and brewer’s yeast in the dough and is baked on a stone oven heated by a wood fire. Instead, these distinctly American pies are extra-sturdy so as to hold up a vast array of toppings, and they quietly occupy their own space on the slice spectrum. Few people fly the flag for brewpub pizza, yet its current ubiquity can’t be denied. Kuban’s thoughts are spot on, of course. The doughs and cooking techniques follow from Italian traditions. There’s also inspiration from the Pacific Coast, specifically in the type of pizzas some critics call “designer” and most of pizza-loving America is familiar with through monolithic mall-staple California Pizza Kitchen. 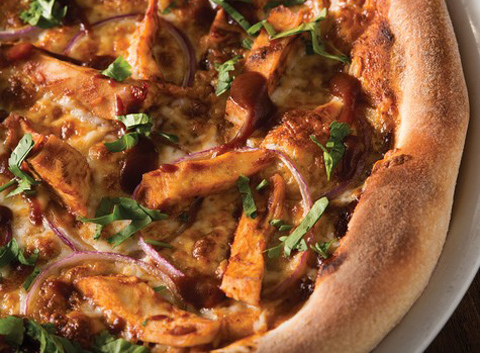 Founded in 1985, CPK might not have invented BBQ Chicken Pizza (as well as Jerk Chicken Pizza, and Thai Pizza, and…), but as a brand it certainly popularized it on a national scale. Aside from the obvious (pizza is tasty, and pizza and beer rule), there may also be more intellectual rationale for the rise of brewpub-style wood-fired pizza. Americans as a whole like crisper, sturdier crusts and toppings galore, which necessitate those crusts. Kuban also notes that several brewpub pizzerias are now employing spent grain, a byproduct the brewing process, in pizza-making. This connects the solid food to the liquid gold, bringing one’s meal full circle and, neatly, aiding efforts for more sustainable enterprises. While that’s an enticing theory as to why pizza and brewpubs go hand in hand, Kuban also reminds of an essential truth: “And what better food than pizza to go with beer?” Yes, that idea again. Brewpub pizza-makers, like the folks behind CPK, also know that different flavors are important to keep eaters’ interest. The same notion applies to beer, so it is logical to follow the same path in the kitchen. 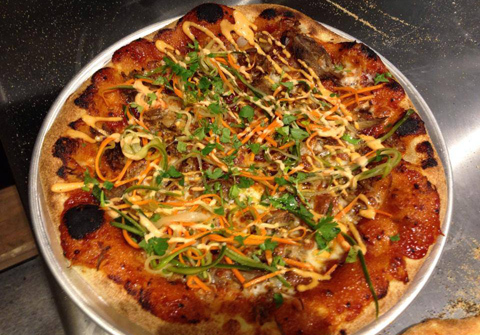 In Fayetteville, Arkansas, the recently opened Woodstone Craft Pizza serves a “K-BBQ” pie. Roast pork sits atop a Korean BBQ-inspired sauce, each bite brightened by pickled carrot, chili mayo, and cilantro. The pie is essentially an update of the warhorse BBQ chicken pizza, and an indication (like many chain-restaurant dishes) of America’s expanding palate. Woodstone’s wheelhouse also encompasses pizzas with asiago cream sauce and onion rosemary marmalade. The crust stands up to all; no floppy slices here. The remarkable thing about Woodstone is that it isn’t a brewpub. Instead, its representative of establishments inspired by brewpub pizza and intent on expanding the experience. American wood-fired pizza will never compete with its more famous cousins for pizza supremacy. However, in its melding of global flavors in a universally accepted package, the largely unheralded style makes for the ultimate drinking companion—sharable, satisfying hand-held food. Brewpub pizza isn’t particularly popular in NYC (which isn’t surprising, given the shortage of brewpubs in the city). However, national trends could spill into the city, and an American wood-fired pizza “moment” could emerge. 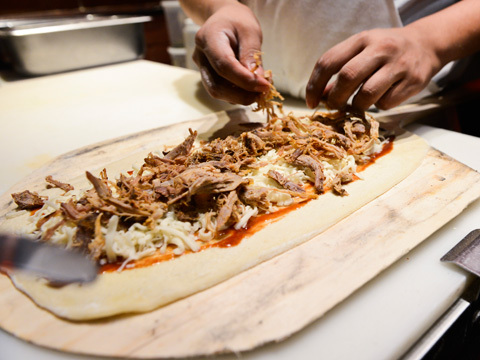 Currently, a lonely non-corporate proponent of brewpub pizza, Taproom 307 in Manhattan’s Flatiron neighborhood, serves its own take on BBQ pizza, piled with pulled pork, sauce, jalapeño, and red onion. The toppings would destroy a traditional Neapolitan crust. However, Taproom doesn’t employ a wood fire oven, or even stick to a traditional round-ish shape (its pie is an elongated oval, and its crust ends cracker crisp). Does it even fit into this conversation? Short answer, yes. Long answer, like defining the America WFO itself, Taproom forces even further thinking about where the beer-influenced pies will go.